3 That are to censure them. 4 Who, with best meaning, have incurr'd the worst. 6 Myself could else out-frown false fortune's frown. 7 Shall we not see these daughters and these sisters? 19 That ebb and flow by the moon. 21 The gods themselves throw incense. Have I caught thee? 25 Ere they shall make us weep: we'll see 'em starve first. Exit [KING LEAR and CORDELIA, guarded]. 26 Come hither, captain; hark. 34 Or thrive by other means. 34 I'll do 't, my lord. 35 About it; and write happy when thou hast done. 37 As I have set it down. I ... oats. i.e., I cannot do a horse's work. 39 If it be man's work, I'll do 't. 59 Requires a fitter place. 61 Not as a brother. 61 That's as we list to grace him. 66 And call itself your brother. 68 More than in your addition. 69 By me invested, he compeers the best. That were ... you. Your investiture of him would be complete if he happened to marry you. 70 That were the most, if he should husband you. 71 Jesters do oft prove prophets. a-squint Squinting was a proverbial effect of jealousy, because of the tendency to look suspiciously on potential rivals. 72 That eye that told you so look'd but a-squint. 74 From a full-flowing stomach. patrimony property inherited from one's father the walls i.e., the fortress of my heart Witness ... master. Let the (whole) world be witness to my making you my lord and master (from this moment forward). 78 My lord and master. Mean you to enjoy him? Mean you to enjoy him (right here and now)? 78 Mean you to enjoy him? 79 The let-alone lies not in your good will. 80 Nor in thine, lord. Let the drum strike Regan is urging Edmund to prove his rights in trial by combat against anyone who dares challenge him. 81 Let the drum strike, and prove my title thine. 87 And I, her husband, contradict your banes. 89 My lady is bespoke. 95 Than I have here proclaim'd thee. 96 If not, I'll ne'er trust medicine. 101 My truth and honour firmly. 102 A herald, ho, a herald! 105 My sickness grows upon me. 106 She is not well; convey her to my tent. 108 And read out this. 119 Upon this call o' the trumpet. 124 I come to cope. 124 Which is that adversary? 125 What's he that speaks for Edmund Earl of Gloucester? 126 Himself: what say'st thou to him? What ... spurn. What I have a right to know and what would be prudent and correct to ask, I disdain to inquire about. 151 Where they shall rest for ever. Trumpets, speak! 152 Save him, save him! 155 But cozen'd and beguil'd. 157 Thou worse than any name, read thine own evil. [Shows the letter to EDMUND. 158 No tearing, lady: I perceive you know it. 160 Who can arraign me for't? 161 Know'st thou this paper? 161 Ask me not what I know. 162 Go after her: she's desperate; govern her. so am I i.e., I'm good as dead. 167 I do forgive thee. 169 If more, the more thou hast wrong'd me. 170 My name is Edgar, and thy father's son. 174 Cost him his eyes. 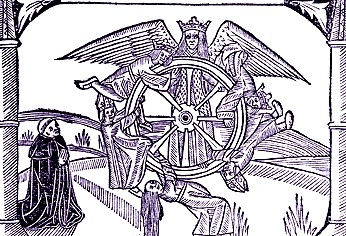 The wheel belongs to the goddess Fortuna, who spins it at random, changing the positions of those on the wheelsome suffer great misfortune, others gain windfalls. 175 The wheel is come full circle: I am here. 179 Did hate thee or thy father! 179 Worthy prince, I know't. 180 Where have you hid yourself? 181 How have you known the miseries of your father? 183 And when 'tis told, O, that my heart would burst! 185 That follow'd me so near,O, our lives' sweetness! 198 Alack, too weak the conflict to support! 202 You look as you had something more to say. 219 And there I left him tranc'd. 219 But who was this? 222 Improper for a slave. Enter a Gentleman [with a bloody knife]. 223 Help, help! O, help! 223 What kind of help? 224 What means that bloody knife? 225 It came even from the heart ofO, she's dead! 226 Who dead? speak, man. 228 By her is poisoned; she hath confess'd it. 230 Now marry in an instant. 233 Touches us not with pity. 233 O, is this he? 235 Which very manners urges. 237 Is he not here? 237 Great thing of us forgot! 238 Speak, Edmund, where's the king? and where's Cordelia? Goneril's and Regan's bodies brought out. 239 See'st thou this object, Kent? 242 And after slew herself. 243 Even so. Cover their faces. 248 Nay, send in time. 248 Run, run, O, run! 250 Thy token of reprieve. 252 Give it the captain. 252 Haste thee, for thy life. 256 That she fordid herself. 257 The gods defend her! Bear him hence awhile. 260 That heaven's vault should crack. She's gone for ever! 264 Why, then she lives. 265 Or image of that horror? Fall, and cease! Let the world collapse and end! 268 That ever I have felt. 268 O my good master! 269 'Tis noble Kent, your friend. 270 A plague upon you, murderers, traitors all! 271 I might have saved her; now she's gone for ever! 272 Cordelia, Cordelia! stay a little. Ha! 274 Gentle, and low, an excellent thing in woman. 275 I kill'd the slave that was a-hanging thee. 276 'Tis true, my lords, he did. 276 Did I not, fellow? 279 And these same crosses spoil me. Who are you? 280 Mine eyes are not o' the best: I'll tell you straight. 282 One of them we behold. 283 This is a dull sight. Are you not Kent? 284 Your servant Kent: Where is your servant Caius? 286 He'll strike, and quickly too: he's dead and rotten. 288 I'll see that straight. 290 You are welcome hither. 291 Nor no man else: all's cheerless, dark, and deadly. 293 And desperately are dead. 293 Ay, so I think. 295 That we present us to him. 296 Edmund is dead, my lord. 296 That's but a trifle here. 297 You lords and noble friends, know our intent. 301 To him our absolute power. 305 The cup of their deservings. O, see, see! 306 And my poor fool is hang'd! No, no, no life! 309 Never, never, never, never, never! 310 Pray you, undo this button: thank you, sir. 312 Look there, look there! 312 He faints! My lord, my lord! 313 Break, heart; I prithee, break! 313 Look up, my lord. 316 Stretch him out longer. 316 He is gone, indeed. 318 He but usurp'd his life. 321 Rule in this realm, and the gored state sustain. 323 My master calls me, I must not say no. 325 Speak what we feel, not what we ought to say. 327 Shall never see so much, nor live so long.